If you drive a tan Buick LeSabre sedan, you are going to see quite a few of them on the road that are exactly like your car. 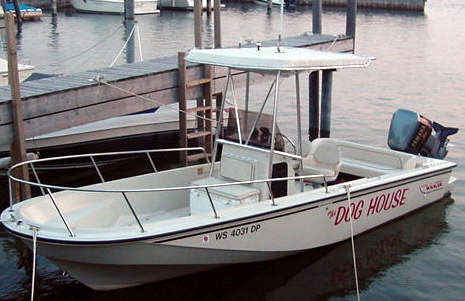 If you drive a Classic Boston Whaler 22-Outrage you will also see many of them on the water, too, but I am beginning to think there really are no two Boston Whalers alike. Between subtle changes in the boats themselves as they evolved over many years of production and owner added modifications, every Boston Whaler is a unique boat. Here is a look at several of them. "The canvas dodger in forest green was done by Rich Eastwood, who used to do Whaler's recreational canvas before Brunswick took control. He currently does canvas for Whaler's Commercial Products Division out of Port Canaveral. He was kind enough to help me out with the dodger, using old aluminum poles, replacing the fittings with lovely stainless. It is a nice setup that we keep up all the time with the exception of when I fish with the guys. "The transom cargo net is "3-stretch" fishing net, encircled with 1/2-inch nylon rope. I have stainless hooks port and starboard that hook into eyes on the inside of the transom at the teak. "The bracket was on the boat two years ago when I purchased it. You do not have a picture of [this style bracket] in the fine brackets section of the [website]. It is identical to an Armstrong single in length--sticks out approximately two feet, never measured it--but seems less refined than an Armstrong. I believe the bracket was locally done in Pompano Beach therefore it does not have a "real" manufacturer like Armstrong, et al. The welds are a bit more obvious, plus the style is more at sharp angles, not rounded in anyway at the edges. I've seen them in the Engines/Parts section of various BoatTraders. They go for about $500 for a single although I've seen them even lower at times. The piece that slips over the transom is quite large, as well it should be. It is attached with six or seven large thru-transom bolts. I assume the white stuff seeping out a bit around the bolts is 3M Marine Grade caulk. This Florida-based 22-Outrage has a number of interesting options and modifications. The choice of the smaller console has permitted fitting a Tee-Top without taking too much room. The leaning post seating option replaces the standard twin seats. A cargo net rigged across the transom area helps keep the little ones from going overboard when Dad slams the throttle to the wall on that big OMC V-6 torque machine. Here are the smaller folk that the netting helps keep aboard. Notice the nice bow-up static trim on the boat. This is often an artifact of hanging the engine on a bracket that does not provide buoyancy at rest. It does give the boat a nice shear line and a look of speed potential. The bow is protected with a Forward Shelter canvas. Also check the amount of overhang there is on the "smirk." This is not just a visual element, as the huge reversed chine in the bow serves to provide reserve buoyancy and to deflect water away from the boat. It is also a very unique and identifying characteristic of the Classic Whaler. A very interesting feature of this boat is the application of a long setback engine bracket to the standard cut transom. This aluminum bracket fits over the original transom instead of just bolting onto it. It looks quite sturdy. The small pump seen on the bottom of the bracket is for live-well water circulation. Details of the construction of the bracket can be clearly seen here. Also notice that the liner molding in this model 22-Outrage has the motor well dam wrapping around the transom area. I believe this evolved later (post-1988?) to a dam which ran straight across the rear of the boat, making a larger engine well compartment that could contain the battery boxes and perhaps an oil resevoir tank. That detail makes one feel less afraid of going right out the back of the boat with the low transom cut out, although it does steal a bit of space from the cockpit. 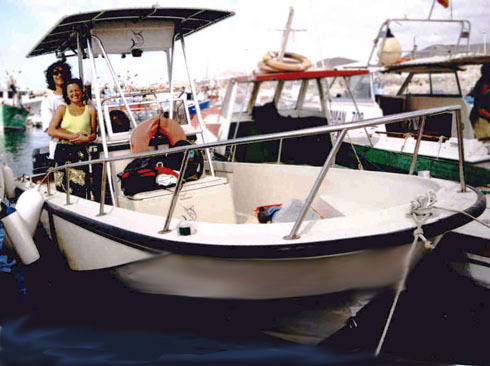 The versatility of the classic Whaler Outrage is greatly expanded by the addition of some canvas, which can turn the open boat into one with some closed areas. In northern Great Lakes boating, we tend to think of the Forward Shelter as a place to get out of the cold and wet, but in tropical climates it provides a place to get out of the sun. The roomy bow of the 22-Outrage handles three passengers and three spaniels. For more information on the advantages of using engine setback brackets like the one seen here, there is a comprehensive article available. 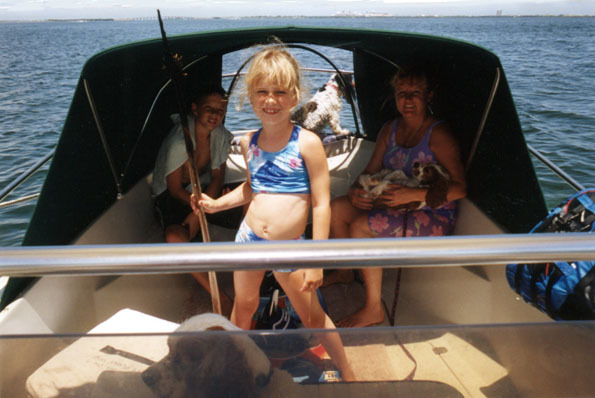 "Here at least some of the first pictures from my new-old Boston Whaler. We could sail her only twice before we took her out of water (renew work). She remember me to a flying fish when we go full gas, enough power as well for water ski. I think we are going to have nice time together. "In the pictures you can see little Aninka, Miryam and me. "One of the reason why I was looking for a Boston Whaler is that I'm going to make a photo archive from the cetacean from this part of the island. Most of the time they swim in between 4 and 15 miles out from the coast, and I like the confidence this boat gives to me. "I have already an other M/Y ( The "Spirit of the Sea") but is for work --dolphin and whales search trips--and has to go back to the harbour every 2 hours. "Perhaps you can see something interesting in this Whaler, will be nice to know more about. 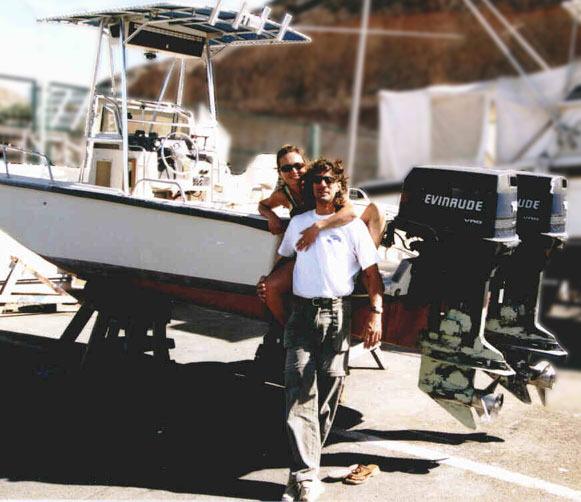 This classic Boston Whaler Outrage-22 has its home port in the Canary Islands, a thousand miles across the Atlantic. Javier and Miryam are embracing the new boat with enthusiam. The Whaler Drive carries twin Evinrude 140-HP VRO engines. It would be interesting to discover exactly how the boat arrived in the islands. If one can judge from the smiles, the new boat has been performing very well in sea trials. From the expression on young Aninka, I think there is great joy in Javier's family for this new boat. 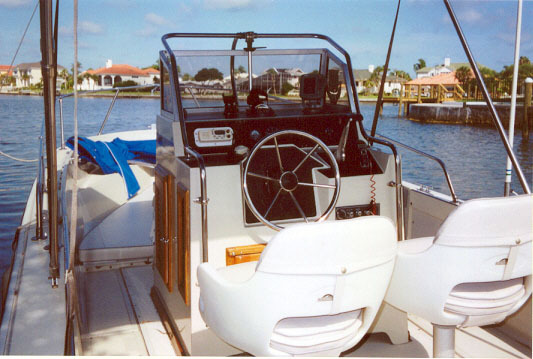 The Whaler Drive option gives the Outrage a full transom and encloses the rear of the cockpit, forming a small rear deck with lazerettes. It also gave Whaler another place to use some fine teak wood for the hatches and coaming. "I was going through some old pictures, and I came across this one of the Whaler I sold this summer that I thought could be added to Cetacea. 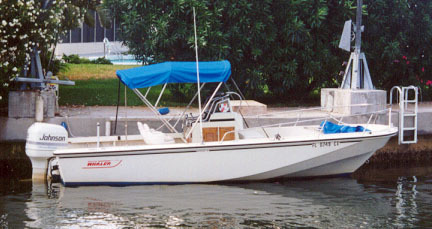 It is a 1991 22-Outrage with Whaler Drive. If you look closely at the transom storage area, you can see that the wood hatches have been gelcoated. This was a great way to eliminate yearly maintenance. Also, you can see the Stingray Hydrofoil on that big Yamaha V-X 250. Not being able to install trim tabs, this was the only way to eliminate the torque list. "Another note of interest is the dock height. As you know, I have a slip in Ephraim, WI in the Door County peninsula. That finger pier was raised during the high water year of 1986. The picture was taken last spring. You can really see just how low the water has become. At the stern, the water depth is about 3 feet." 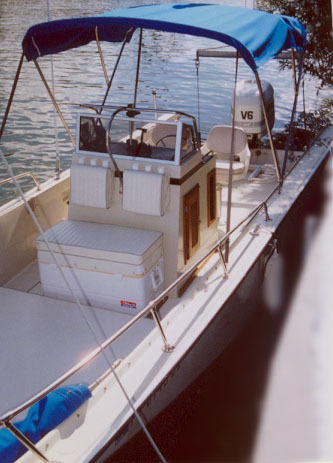 The classic hull and styling of the 22-Outrage was still available as recently as 1993. 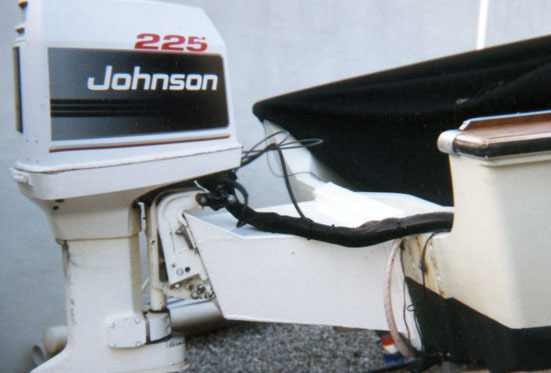 Yamaha engines were becoming more common on Whaler transoms, supplanting the usual OMC power found there. The stern seat is a nice option. This boat has the Whaler Drive option, which replaces the standard cut transom with a new rear deck and an engine bracket with approximately 30-inch setback. 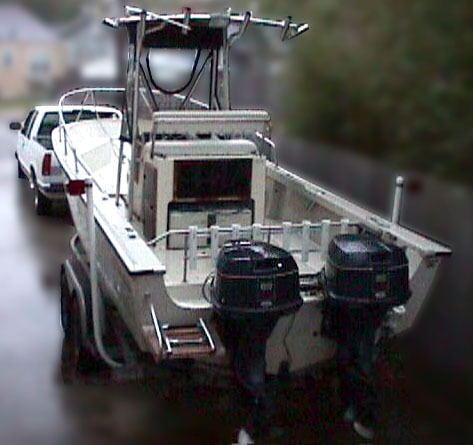 Selecting the Whaler Drive option resulted in a total make-over for the rear of the boat. The cut transom was rebuilt into a full transom and a new deck molding added. 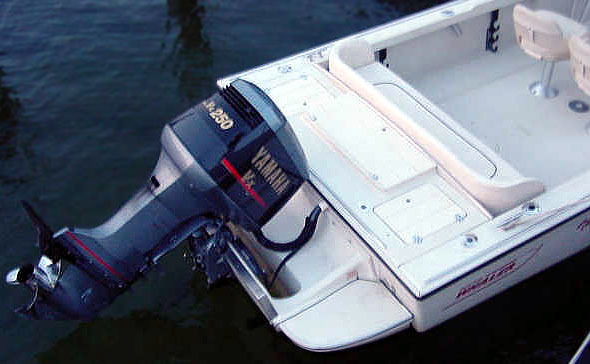 Then the Whaler Drive appendage was bolted to the transom, creating a long engine setback which could accommodate large V-6 engines (including twins) like the Yamaha seen here. You can't get much more classic than this: a beautiful Whaler Outrage-22. Designed over twenty years ago, there is really nothing out-of-date about her profile. 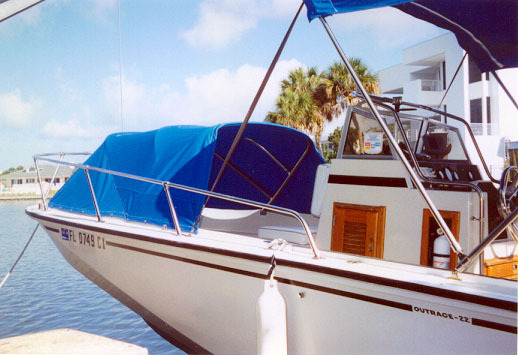 This Florida boat has a large suntop, as opposed to the smaller flying top seen on many northern boats. 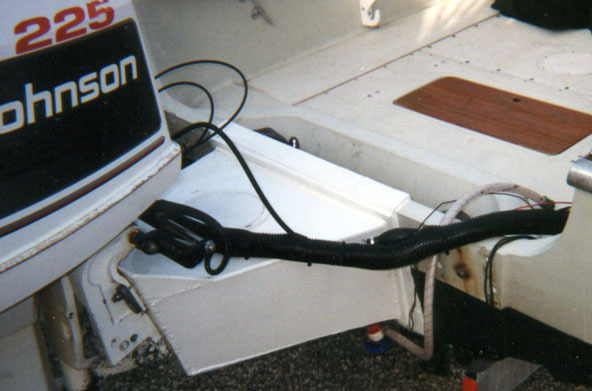 Note the OMC power on the transom, the most common propulsion for Whalers in the 1980's. The forward deck has been augmented with this big bow cushion, a factory option popular with non-fisherman owners. On the forward end of the super console is the classic Whaler cooler seat arrangement. Just visible in this view, the motor well dam on this 1987 Outrage is curved. Here is another boat in southern climates but with a forward shelter. The availability of factory options for canvas accessories like this made the Whaler a very versatile boat. 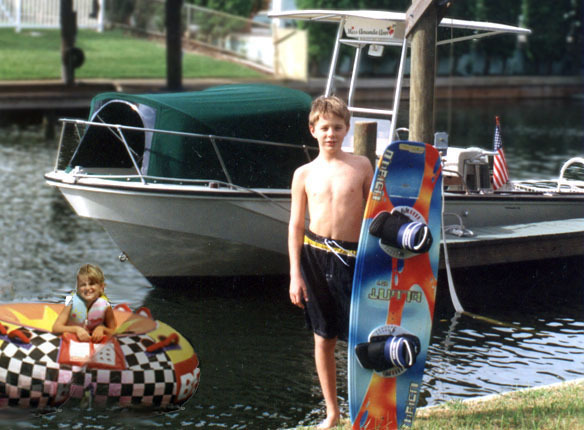 This Outrage was equipped with the optional Super Console, significantly larger than the standard (or Montauk-sized) model. The classic Whaler always includes a very nice, six-spoke "Destroyer" style wheel made by Grant. This expensive detail really gives the Whaler helm a wonderful feel, letting the helmsman know there is something substantial about the boat. 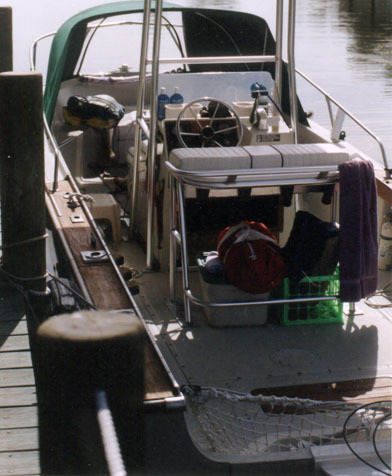 Stainless steel grab rails wrap around the console, providing something to hang on to when in rough seas. Beneath the console there is plenty of storage room. The wheel looks like it is mounted on centerline, which may make steering while seated slightly askew. You can't get a boat cleaner than this! In searching through my files, I found another interesting Outrage-22 photos, which I will append here. This classic Whaler shows the detail of the engine motor well dam which runs straight across the back of the boat. A stainless steel railing has been added across the rear cockpit, augmented with rod holders. It's another approach to providing a sense of partition from the cockpit to the transom area. This is another boat with a Tee-Top, and another pair of Evinrude's, this time 88 SPL's. The seating arrangements are customized with a Natical Designs leaning post and tackle center, plus an auxillary fuel tank. The page has been accessed 83992 times.